Last year at Meat Fight’s MF1K I had the opportunity to meet Ryan and Sunnye Childers of RVC Promotions. RVC is a food and beverage promotions company with events such as cooking classes, alcohol tastings, as well as BBQ bus tours. Their business really intrigued me and I wanted to go to an event, but life happened and it took me nearly a year to make it to one of their events. Ryan invited me as his guest to attend a Beer and BBQ Pairing at Old Town Brewery in Downtown Lewisville, TX and I was finally able to attend. The night included music and beers paired to go with a BBQ dinner presented by Bet the House BBQ. Before I get started with my thoughts of the evening I want to throw out the disclaimer. While I like beer, I’m the guy beer enthusiasts hate. I’m just as happy with a Miller or Bud Light as I am with something from a local brewery. To put that in BBQ terms, that’s the equivalent of the guy who thinks Dickie’s is just fine and doesn’t get the BBQ revolution going on.  You don’t want that guy reviewing BBQ, so I’m not going to review beer. 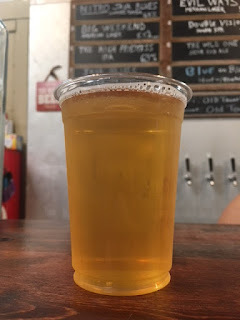 I will tell you that their Weekend Brew was my favorite. I could spend the night there drinking it and will most likely do that in the near future. 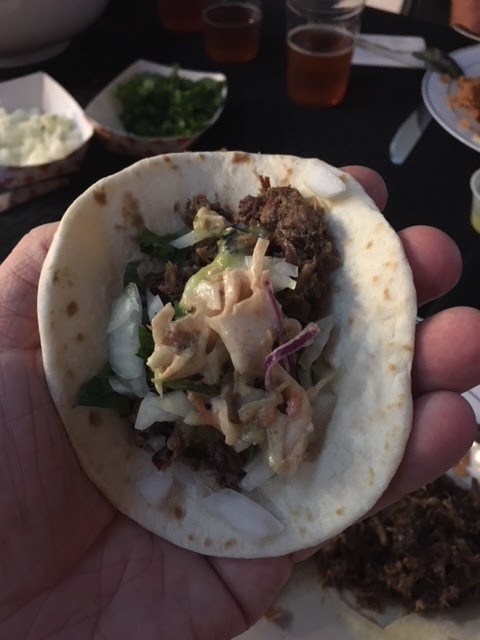 The night began with brisket and coleslaw stuffed eggrolls for appetizers and introductions from the Pitmasters and the Brewer. 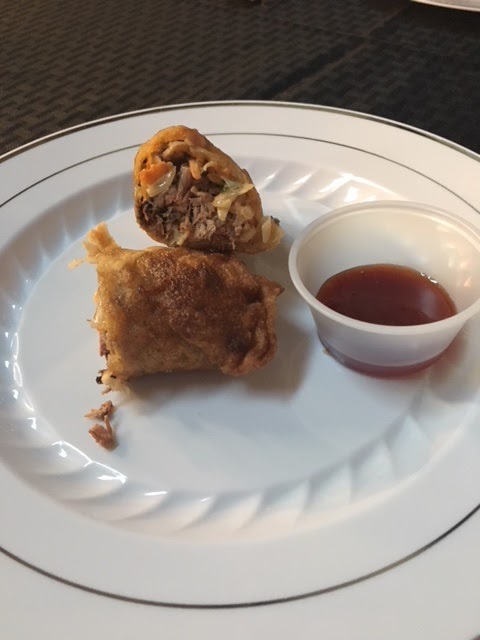 I’ve had Bet the House’s egg rolls at Red Dirt a few times and they are one of my favorite nontraditional BBQ items out there. While previous ones I have had were pulled pork and mac and cheese, I somehow loved the brisket and slaw even more. The savory brisket with the slaw was heavenly. The rest of the meal came shortly after and was served “Family Style”. The menu included brisket, barbacoa, pulled pork, tortillas, Spanish rice and Mexican coleslaw. 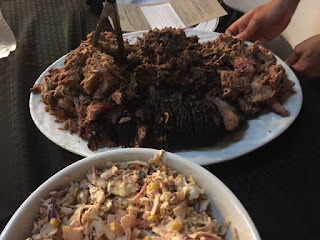 It had been a few years since my last visit to Bet the House and after the first bite of brisket, I knew I had to get back! The brisket had the perfect balance of salt and pepper and was cooked to perfection. 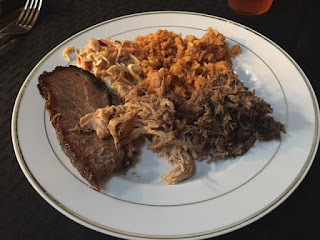 The barbacoa was perfect with a nice kick, and my least favorite meat, pulled pork, was still pretty good. With the meats, I decided building my own tacos was the way to go. My favorite combo was the barbacoa with the Mexican slaw. I literally had to stop myself from eating these as I didn’t want to stop, they were so good. The tacos, with the perfectly cooked rice, made for a great Friday night dinner. I knew dessert was still to come, so I had to get up and walk around to make room. I had the opportunity to talk with Bet the House owners Shawn Eagle and Cody Smithers. In conversation I learned every Sunday they sell BBQ klobasneks (kolaches), so guess who’s going to Denton on a Sunday soon! 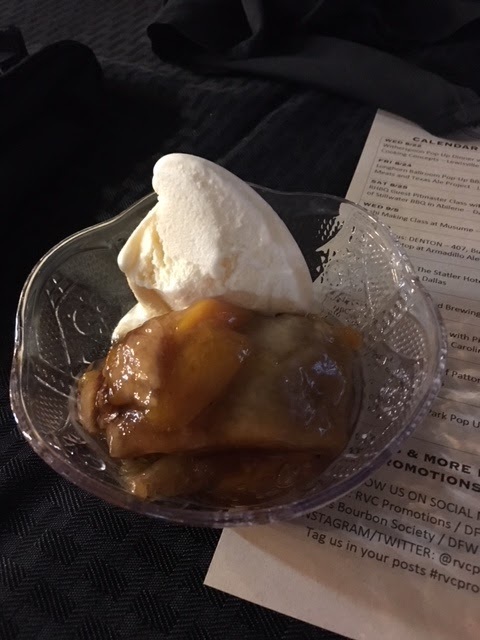 It was time to serve dessert so I went back inside where I was served smoked peach cobbler with vanilla bean ice cream. It was the perfect ending to a fantastic night. My first full experience of an RVC event was a success and I can’t wait to attend another one soon. Be sure to check out their upcoming calendar, you may see me there.